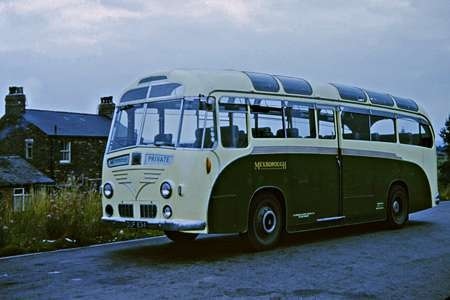 Mexborough & Swinton acquired a number of former Southdown vehicles during the 1960’s, including this Royal Tiger with Harrington Wayfarer coachwork. New to Southdown in 1954 as its 834, it was one of a batch (830-834) of five Royal Tigers with Harrington Wayfarer C26C coachwork. However, whereas 830-833 were 8ft wide PSU1/15 models, 834 was a one-off 7ft 6in wide PSU1/11 model. Renumbered 1834 around 1960 it was used principally on the Brighton to Heysham part of their Irish tours. It was acquired by M&STC in 1965, and withdrawn by them shortly after this photo was taken in 1968. C26C leaps out as being rather odd, but the copy reveals why the batch was seated thus. Any ideas, please, as to why this one was only 7ft 6in, when the other four were to the usual 8ft? Could it, perhaps, have been because of the need to visit parts of Ireland where a standard 8ft vehicle could have problems – but the copy mentions only the Brighton to Heysham portion of the tour, as if an operator from across the Irish Sea dealt with the rest. Interesting!!! Thanks John for the excellent picture. 1832 and 1833 were also 7′ 6” PSU1/11’s and were used for the Irish leg of these tours by UTA until return to Southdown in 1963. They were subsequently painted in the Blue and Cream livery of Bucks Coaches of Worthing, who had just been taken over by Southdown. These vehicles replaced a pair of Bedford OB’s inherited from Bucks. 1832 and 1833 were withdrawn by Southdown in late 1966. It is interesting to note that 1832 and 1833 were sold to UTA in order to run the Southdown "coach cruises", never tours, that ran in Northern Ireland. Regulations in the province permitted only UTA to run PSVs. They were transferred at book value, with the agreement that they would be bought back when no longer required. At least Wallace Arnold and Barton had the same arrangement.